What is the role of supplier management? The objectives of a Purchasing Strategy / Procurement Strategy? What is its impact? Where should the CPO sit in an organization? What is the scope of a CPO responsibilities? The Matrix below, developped by Michel Philippart in 2001, shows that Supplier Management Scope and Impact vary across organizations. Like for the other essential activities of the enterprise, the most important purpose of the function is to deliver shareholder value. Unfortunately, few organizations understand the relation between suppliers and shareholder value. Many do not include it in the supplier management role, most of the others mention it but do not understand the difference between cost reduction and shareholder value development. Even fewer have the right processes in place to insure that supplier management can deliver on this objective. Do I need to be better than last year or better than my competitors? Am I organized properly? How do I staff, train, develop, measure, promote? Should I measure the quality of the relation with my suppliers? How? Then what? How to change culture? How can my team become proactive problem solvers rather than reactive specification finders. How to develop their "Purchasing Leadership, and increase their footprint? How to integrate acquisitions or merger? Those are the type of issues Michel Philippart has faced during his career, working for top consulting firms like McKinsey or Booz Allen & Hamilton, and global companies like PepsiCo / Frito-Lay and GlaxoSmithKline / GSK Biologicals. He continues to explore them at as Professor Supply Strategy at EDHEC Business School, through hands on management, training, coaching, project leadership, tutoring and more. He also looks at the impact of disrupting technologies like the Blockchain and Artificial Intelligence on Supply Management. Michel Philippart Professor at EDHEC Business School, teaches Strategic Supplier Management and Operations. He continues to research the field after completing his Doctorate degree in Business Administration at Paris Dauphine University. Both in his academic and professional activities, he is promoting the development of Strategic Supplier Management as a contributor to Shareholder Value. To understand how to drive costs down is important for a large part of the spend, but it is not sufficient when all competitors adopt the same strategies. 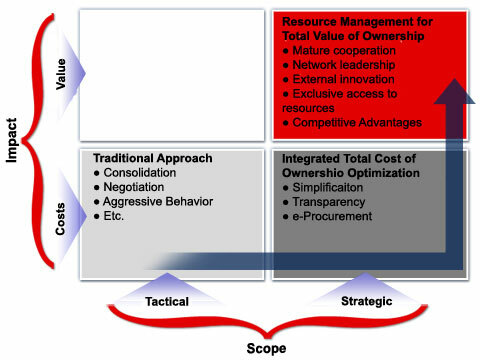 In aggressively competitive environments, cost focused Procurement does not create value, but merely avoid destroying it. If key competitors have similar methods and achieve similar results, the cost reduction is quickly given away to the customers represented by equally efficient procurement managers. Today, driving cost down is not differentiating!